The Guitar Column: DIY iPhone Holder for Guitar! My good buddy Randolf Arriola came up with this holder that mounts his iPhone to the guitar, giving him easy right-hand access to the touch screen. A really great idea considering that many of the current commercially available iPhone holders mount to the guitar neck near the headstock. As Randolf describes it, "The pic is an early prototype. I tried several along the way but my current latest is actually a mini speaker wall mount with one of the iPhone grips which I can attach or remove with a simplex hex key. It's the most secure and functional version yet, until I come across something else down the road." Reminds me of the Synclavier guitar interface from the 80's. 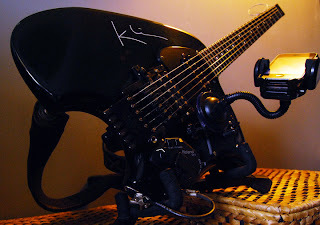 Nice Klein guitar too! I've known Randolf for some 25 years and in that time I've seen him evolve from a Van Halen-esque guitarist playing in Top 40 cover bands, to an Allan Holdsworth devotee capable of executing several of the master's intense chordal pieces. And always with an ear for sound and a penchant for hours of endless tone tweaking. 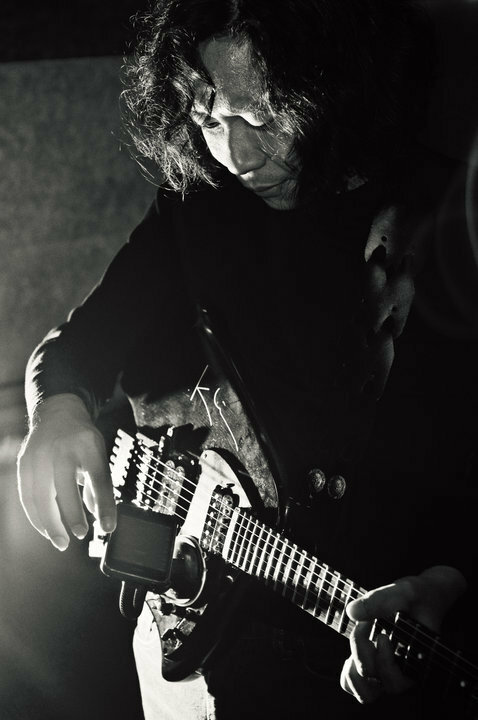 Randolf has spent the last few years delving into the world of looping and will be headlining at this year's Y2K-X 10th Anniversary International Live Looping Festival in Santa Cruz and San Jose, California. He will be performing on October 16th at Pearl Alley Studios in Santa Cruz. Rock n' roll Randolf, do us proud!